As many as 20 local youth spent a week learning the basics of one of Canada’s most in-demand professions earlier this summer – and they loved every minute of it. 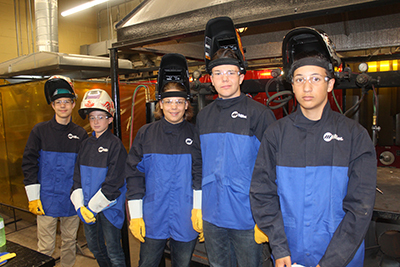 Students enrolled in both public and Roman Catholic schools had the opportunity to participate in the week-long Mind Over Metal workshop, offered by the CWB Welding Foundation. The group of kids, aged 12 to 15, gathered at Orangeville District Secondary School (ODSS) where teacher Richard Alexander put them through their paces. Speaking to the Citizen, Mr. Alexander said the purpose of the workshop is to bring awareness to the welding industry and let students know just how lucrative a career in the business can be. Students spent full days from July 9 to 13 at ODSS, from 8:30 a.m. to 3 p.m. While they are primarily gaining an insight into the world of welding, the program also introduces literacy and numeracy skills to students. Breakfast and lunch was also provided. The CWB Welding Foundation has been running camps over the summer since 2015. On the organization’s website, it states the main purpose of the camp is to “change the perceptions of youth and their parents about welding and careers in welding”. It certainly seems to be doing the trick. Kaylynn Davidson, a Grade 6 student at Princess Elizabeth Public School said she’s “had a great time” over the first couple of days at camp. “I really wanted to learn how to weld properly, I’ve been here two days now and I’m getting better at some of the things. It’s been fun learning about something new,” Kaylynn told the Citizen. Harrison Douglas, a Grade 8 student from Island Lake Public School said he wasn’t sure what to expect when he first heard about the program, but he wanted to learn a new skill he could potentially develop even further once he moves onto high school. According to Mr. Alexander, the students also had the opportunity to make a hot dog roaster that they took home with them upon completion. Carter Webber, who will be going into Grade 9 at Anderson Collegiate Vocational Institute in Whitby later this year, says the “different” way of learning has had a big impact on him. To learn more about the CWB Welding Foundation and the Mind over Metal program, visit www.cwbweldingfoundation.org/programs/mind-over-metal-camps.